In Nia we teach facing a mirror with our backs to the students. The mirrors help me stay connected to the class. I can look in the mirror and make eye-contact with someone. I can peruse the room and see what is going on. It is different from the way it used to be when I took Jazzercise so many moons ago. The teacher faced us and would do mirror actions. When the class went left the teacher would actually go to his right. When we went right the teacher went to his left. When we moved forward the teacher also moved forward coming toward the class. When the class moved back the teacher would go back. The teacher facing the class allowed for face-to-face connection. The other day I was teaching a class and I was doing the “mirroring” and as I was pausing in the movement, I realized why I didn’t like “mirroring” as much as teaching with my back to them. I couldn’t share my sensation. I could not teach what I was sensing. I think part of what makes Nia so joyful and fun is that the teacher is having fun. We are taught to be in our bodies and dance. We learn routines, but if while teaching the music motivates us to do something off from the choreography, that is fine. We get to play. We get to sense what is happening in our bodies and share it with the class. Then the class gets motivated to dance what is in their bodies . . . their individual body. When I was paused in that stretch I wanted to tell them what I was sensing and have them explore their bodies sensation, but I couldn’t. I had to pause and adjust my mind and my words because we were not bending the same way. So, yes, I could say, “side” leaving out which side, but it felt less authentic because we were not experiencing the same side. Silly, I know, but it was a thought that popped into my head as I was teaching. Sometimes there are no mirrors available in the classrooms I am assigned to teach in, so I have to teach facing the class and that is fine, but I really like having mirrors. Also, I notice that when I am facing the students even when I used left or right or even use a landmark in the room . . . there are some that pause for a second in confusion. They are looking at me and seeing me do the opposite from what I am asking them to do and you can just see the internal struggle in the face. This is especially the case when instructing twists. Twists are already a little challenge for the brain so when the arm goes up and around and the leg goes up and around, crossing over the mid-line of the body, the brain really likes to see it as the body is to do it. The mirrored way really has people all twisted. While we don’t have really complicated steps in Nia, it seems like the students learn them faster when they can see exactly how it is to be done. They don’t have that extra brain work to do of adjusting for left and right. They see my left foot going over to the right side and they get it. It takes a lot to see the right foot going towards them and over to the left while I am telling them to take their left foot front and over to the right. It is nice to dance without the mirrors sometimes, as I wrote about in my post Mirrorless Inward Reflection. For some it helps them be less concerned about how they look while they are dancing. It can allow people to be more introspective. It can enable people to connect to their own Conscious Personal trainer. It is a good thing and definitely something I / we can do when we do not have access to mirrors, I just happened upon an insight recently and thought I could share. Do you like to take classes with mirrors? Do you find it easier to follow when the teacher has his/her back to you? Today after Nia Class a Nia White Belt and I were talking. We were talking Nia over coffee and a friend from her past happened by. So she joined us. She was coming from Jazzercise and so, of course the conversation turned to us sharing some information about Nia with her. She sounded as if she was willing to try it but also as if she was never going to move away from Jazzercise. I love that she is moving. I think it is important that people exercise and one of the ,best ways to ensure that is to find something you like or better yet — love. I appreciate that there is so much out there for people to participate in. Of course, I would love for you to come to my Nia class. I would love for you to love Nia. I think it is great because it addresses the BMES, but not everyone likes that in their exercise. In the course of our conversation she said she tried Zumba, but it didn’t work for her that well. She had already mentioned that she takes it easy on her knee so I felt justified in recommending the correct type of shoe. I often hear people don’t like Zumba because it hurts their knees and it often has to do with the shoes they are wearing. In Nia we dance bare foot. We do not twist on our foot or scoot, we pick our feet up off the ground. When doing a dance exercise or a fitness class, like Zumba the need for shoes is apparent. In Zumba there is a lot of twisting, shuffling, and sliding. You need the right shoe for that. Exercise sneakers, tennis shoes, cross trainers, and running shoes are not the correct shoe for doing Zumba or any type of dance that requires shoes for that matter. 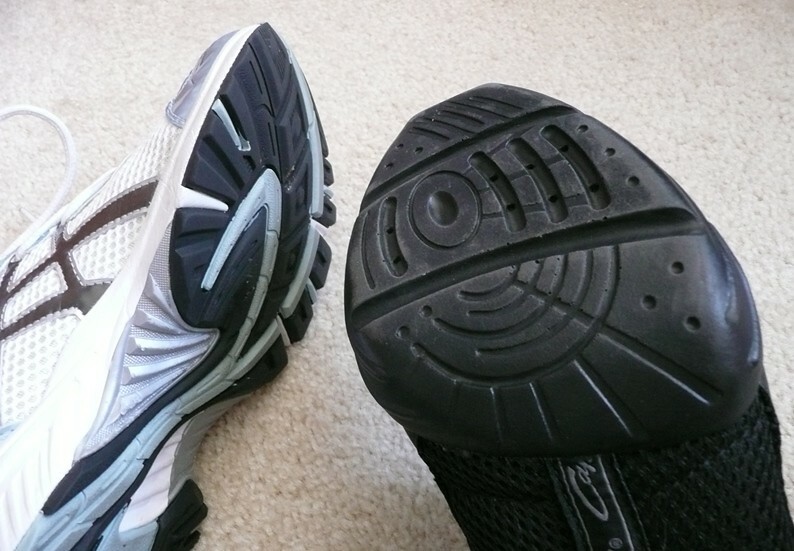 An exercise sneaker or tennis shoe has what you want in regards to cushion, construction and support. A cross trainer has even more support in the shoe because with cross training you are moving forward, backward, side to side, and even up and down. So the shoe itself is made to support your foot and keep it secured in the shoe. And running shoes are great for the cushion. They cushion your step and help absorb the shock of your foot landing on the earth. So these types of shoes are great, the “upper”, because they are built for impact and moving in different directions, but it is the sole you do not want to dance on. These shoes are made for traction. They are made to stop you from twisting and sliding. When you are playing tennis, doing cross training, or running you don’t want to be slipping, sliding, and twisting around. So the soles are made to keep that from happen. I mean, have you seen some of those soles? They look like tire treads. Great for outdoors. Now a dance shoe, say a jazz shoe or a ballet slipper is perfect for dance. 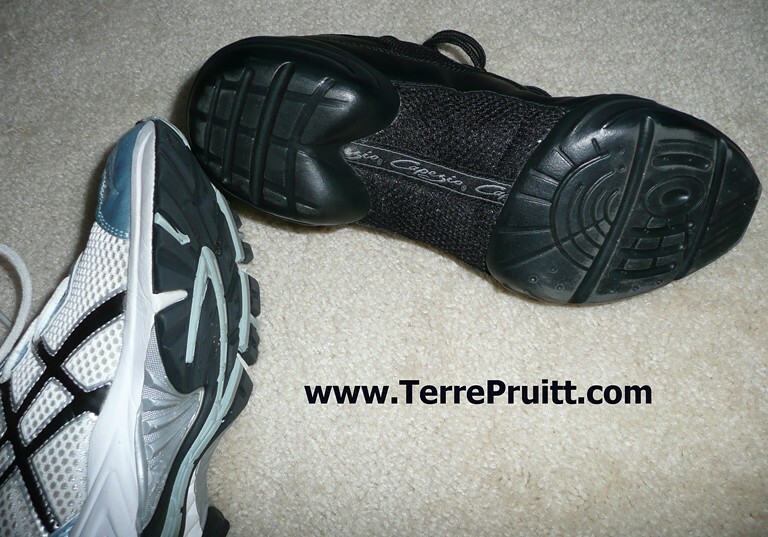 Without all of the cushion and support that is an athletic shoe they are usually light and easy to lift and move in. The bottom of the shoe has material that allows you to slide and glide, spin, turn, and twirl on the dance floor. Perfect for moving to the music and getting your groove on. And THAT is the kind of sole you want. Something you can twist in. Something you can slide in. Something that won’t stop you foot dead as you dance across the floor. But then again, those shoes have the SOLES you want, but not the support. Since you are doing cross training type of motion (forward, backward, side to side, and even up and down) you want that type of support. And it would be nice to have some cushion too, huh? Well, do your knees a favor and do not do Zumba in tennis shoes, cross trainers, and running shoes. And do your feet a favor and do not do Zumba in a jazz shoe or a ballet slipper. What you need is a dance sneaker. Someone, somewhere – I don’t know the origin of them – decided to combine the two. Brilliant. Someone added the support, cushion, and comfort of an athletic shoe to a sole that can slide and glide. Whew! This is genius. This will help save your knees and other joints! I know Zumba has a brand of shoe that has a great dance sole, I don’t know about the cushion and support of the shoe. I bought Capezios because they don’t have a sole over the arch so they allow for the foot to really move. Since you are investing in your health and wellness by going to a dance exercise class, please take it a one step further and splurge for those dance sneakers. They don’t have to cost more than $50.00, and you will be saving yourself so much more in the long run. You will be allowing your body to move with greater comfort on the dance floor. What do you think? Do you think a shoe that allows you to slide a bit is better for dancing? Doesn’t it make sense to have a dance sneaker? I found Nia back in 2008. I was looking for an exercise that was more like dance. I had several people in my life at that time that loved to dance, but their partners wouldn’t dance with them. They claimed they would love to do exercise if it was more like dance. I also had people in my life at that time that were younger than me, my age, and just slightly older and they couldn’t move very well. They moved with pain and/or it was an extreme challenge for them to balance and just a mixed bag of things. I believed that movement could help some of the issues facing them and many others. I also loved to dance and thought it would be great to have an exercise class that was dance. I looked at doing Jazzercise, but I think at the time the franchise thing (or however they did it/do it) was not something I wanted to do. And back then Zumba was not yet the rage and I had thought it was ALL Latin music (I know better now). I remember I came across a website that was talking about Trance Dance. So I researched that a bit. That sounded interesting, moving your body in your own way to music. But the information I found said that you kept your eyes closed and/or were blindfolded while dancing and someone would watch to make certain people didn’t injure themselves. That part and the fact that some sites stated there actually was a form of “Trance” that people entered into kept me from wanting to do that. But somewhere there was a mention of Nia. So I tried to find all the information I could on this Nia. Back then it might have even been NIA. I don’t remember when it changed and even now some places still call it Neuromuscular Integrative Action. It has gone through a few name changes, but at present it is just The Nia Technique or Nia. It IS non-impact aerobics and it IS Neuromuscular Integrative Action, but the name is Nia and it no longer “stands” for anything. And in the four years that I have been doing it and learning about it, it has changed. It was originally created by Debbie Rosas and Carlos Rosas in the early 1980s from a desire to help people exercise in a different way, a way that addressed more than just the physical body. When I joined Nia there were really starting to talk a lot about the next phase of Nia. You see, even though Nia remains true to the original concept of a Joyful workout, it does change and it does grow. Anything that wants to survive has to change or at least be flexible enough to endure the change that happens around it. Nia changes, they change the way they deliver training from the routines to the intensive — so the continued education changes. Nia’s training material is phenomenal. When you read through a newsletter or a manual or listen to a conference call you can sense the care taken in creating the material. It is nice to be a part of Nia. It is interesting. It is amazing to see how far Nia has come and how much is has changed in the short time that I have been a teacher. The roots of Nia are still there they are just always finding new ways to share it. As with any an all certifications I have earned I did my research beforehand. It is important to know how much the initial training cost and how the licensing and/or certifications works. It is important to know about continued education and re-licensing or re-certifiying. I liked everything I saw about Nia. It took me four classes before I decided to invest the time and money needed to teach. I took the training in December of 2008. I started teaching in February 2009. I have been teaching Nia ever since. I have had the same Monday and Wednesday class since February 2009. I have had other classes at other studios and gyms on different days and different times. At this writing I am teaching Nia five times a week in San Jose – not including subbing dates. I have three classes for the City of San Jose; a Tuesday morning and a Tuesday evening class. I also have a Thursday evening class. My schedule is update regularly on www.HelpYouWell. I took a second Nia training in November 2012. I just finished posting my way through the #13 principles of that belt (Blue Belt). 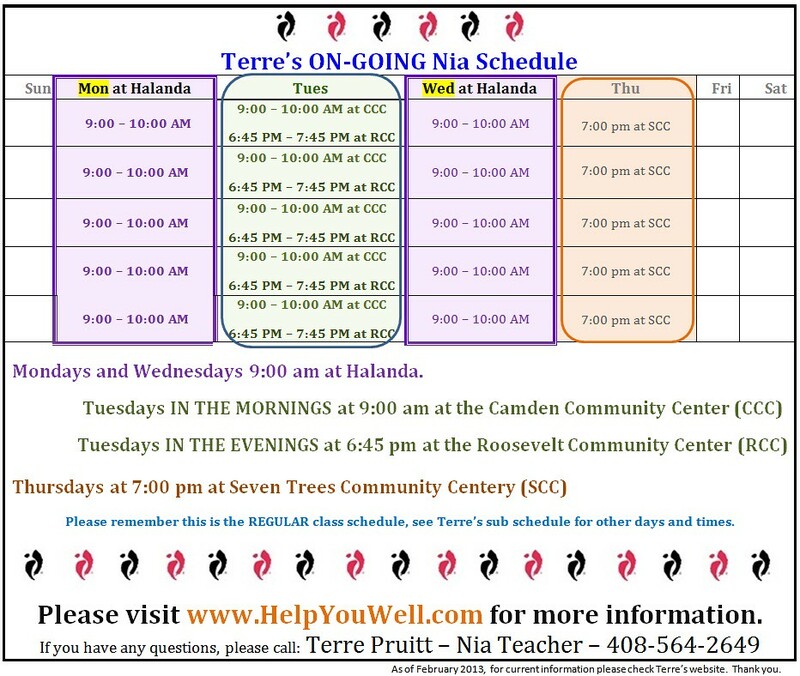 I am excited to have so many opportunities to share Nia with people each week. As I said, I have five classes and as I said things change. So when you are ready to join me in one check my site to confirm time and place and all those details. I would like for the number to grow. Just as Nia is growing, in leaps and bounds and for the better. I have a confession to make. It is one I might have even confessed before. I know I have done it before. It is easy for me to get caught up. I want to please people. I want the supervisor to know that I am working to keep the students IN the class. I want the students attending the class to like it and want to be there. When you are a substitute instructor leading a different format than is usually taught it is very different from when you are teaching a class of the expected format. Many people are taught that cardio – aerobic exercise – is extremely fast, high impact, and difficult so it is very hard to change that mindset. I was asked by someone who understands both the fact that cardio does not have to be extremely fast or high impact and that people are trained to think it is, if I could do Nia a little higher because people expect cardio to be a specific way. So caught up in wanting to give the students what they are accustomed to getting I put together a routine . . . kind of rushed . . . that didn’t have ALL the elements that a Nia class normally has. It was not good. It felt “off”. I was trying to make Nia something it is not. Nia is not Zumba. Nia is not Cardio-Sculpt. Nia is not extremely fast, rushed, and high impact. Nia is not Jazzercise. Nia is not UJAM. Nia is not all of or any of these other names that there are for classes that are fast, rushed, and high impact. Nia is an amazing practice. Nia is a great workout. Nia is a wonderful cardio dance exercise. And I need to stop trying to make it be something it is not just because people are used to cardio a specific way. So I did a routine that didn’t feel right to me. I thought I would get up the next morning and do the same routine for the class I was asked at the last minute to sub, I was going to try to “bring it” to the students. As I was getting into bed a little agitated from the “not feeling right class”, it washed over me like a refreshing revelation . . . . DO NIA! Duh! Bring “IT”, and make that “IT” Nia. I got caught up and in my trying to bring the students what they are used to, I didn’t allow them the richness of something new. The richness of Nia. Now, I want you to understand that the Nia Technique creates wonderful routines and all we teachers have to do is learn them and teach them. But we are also allowed to use other music, make up our own routines, mix and match the routines they have created, and make up our own katas. Of course, we need to follow the Nia class formula and the seven cycles which contain the traditional warm-up, move it, and cool-down. I also think when creating a routine/class – in general – it should be balanced; as an example not all songs/movements should be lateral ones or forward and back ones, there should be a mix of movement and the 52 Nia moves. I create routines from Nia routines all the time. So it was not the fact that I put songs together that created the not feeling right routine, it was ME. It was ME trying to make Nia something it is not. I need to center myself. I need to stick to what I know and not try to give people the class they are used to. I KNOW Nia is amazing and awesome and does need to try to be anything it is not. I KNOW THAT. I just get caught up. Thank you for letting me confess and do a public face-in-the-hand-plant! Do you EVER do that in any section of your life – try to make something be something else even though what you have is just perfect the way it is?